After months of contemplation the Government of Belize has finally came to a conclusion to default on its external debt. 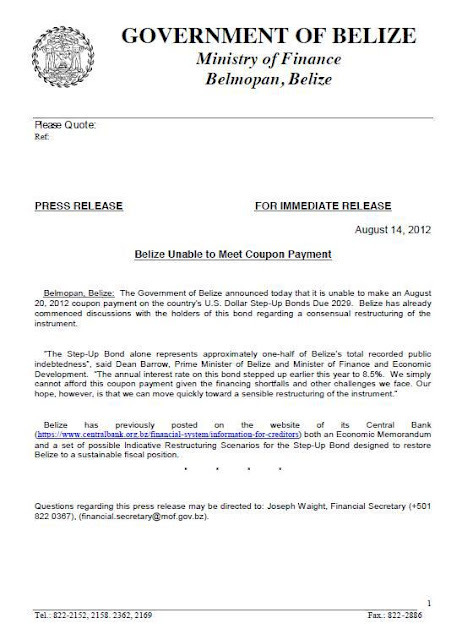 Earlier in the year, Belize has been discussing restructuring with bond holders. Belize has previously posted on the website of its Central Bank both an Economic Memorandum and a set of possible Indicative Restructuring Scenarios for the Step-Up Bond designed to restore Belize to a sustainable fiscal position. The Belize Default comes a day after a local television station reported on an advisory issued by financial analyst Carl Ross of Oppenheimer & Co. Inc. In the report Mr. Ross refers to the recent expropriation of private telco and electricity companies in Belize, Belize Telecommunications Ltd. and Belize Electricity Ltd. as adding to the country’s debt load.